As usual the work is to be done through the Council's privatised service company Integral but the work will be carried out by S C Joseph. I am sure it is all above board but just how many Council building contracts do S C Joseph receive? Their bid was £10K below those of the other bidders. Perhaps they know something the others do not. Is this a roof repair or is the roof being stripped & then reroofed which I suspect is the case given the amount of money being used? Given S C Joseph are not a specialist heritage roofing company or even a roofing company they are builders so why indeed have they got the contract? For this sort of work you need a roofing company who know what they are doing & I don't think S C Joseph do when it comes to roofs this whole things has a rather bad smell about it to me! I'd like to know more bout the details of the roof repair as £99k seems a lot of money for a roof repair…also they have not listed the other bidders by name just their tendered price why would that be? I've put in a FOI request,asking for the names of companies B & C who also tendered for the roof repair works…as I think it is in the publics interest,to know what companies are bidding for what contracts with the council…regardless of whether or not they win those contracts,as it is public money which they are bidding for after all. So they give the job to Integral who tender it out and then the Council who appear to have no part in the tender process approve the winning bid! The Council pay Integral for a service who do nothing much except run a tender process and then take a cut from the total cost. Would be interesting to know out of the £99k plus £20K how much goes to Integral for doing very little. When they prepared the original specification for repairs to the roof (at £99K plus £20K how come they missed that there was a leak in the roof. Seems like poor survey and costing work yet again and another lump of money presumably goes to Integral/S C Joseph. The inefficiency seems staggering to me. Appears to be a lack of control over costing & what roof repair works was to be undertaken on the library from HC…devoid of any diligence on there part…the council have there own property maintenance department or is this really integral? & if not why didn't they handle this? i was going to do another FOI to get the schedule of works which was sent out to those companies to tender to…I guess now I will have to get in touch with integral to get this information too? it would make you wonder whether or not they caused that leak themselves given it was not picked up in the original survey? Slightly off topic, but the Northern Magazine building at Rotherwas has been surrounded with Heras fencing recently and I noted today that 'Integral' signs were going up - next, S C Joseph vans no doubt. Something very odd about this ongoing and very lucrative arrangement. But are they the cheapest? Are they up against anybody else when tendering? If so are they getting inside information as to what others prices are being tendered so they are able to put in the cheapest? Yes well they seem to be very snugg & cozy in bed together don't they?! my understanding is if HC need construction work doing & it's below £200k then it's the service provider integral who the tendering process goes through…which makes it ripe for abuse in my opinion. I'm also hearing that integral are to be replace as the council service provider in August but who is replacing them I do not know?! So today I've been chasing up integral to get some answers to my FOI…I can tell you they are a slippery bunch of eels giving me the run around eventually got through to their national accounts manager a man call John Eastley who thinks because there a private company he doesn't have to answer my FOI as being a private company it excludes them from the FOI process so then told me he wasn't going to continue the conversation that I should contact their HR department then abruptly hung up…(I think he was a little bit rattled that I should be asking such things). however I have his email address so he won't be getting off that easily…his behavior also leads me to suspect that he has got something to hide? The council is changing its services provider in august from integral to Balfour Beatty…I have been informed but I've also been informed that Balfour Beatty have bought out integral? Can anyone confirm this? but hopefully Colin will be able to sort this for me? It is remarkable how they win so many - I am sure they do not have inside knowledge. Does anyone approving these contracts ask detailed questions of those officers making the recommendations? It comes as no surprise to see dozens of complaints about elected members’ bad behaviour and yet more closed door meetings reported in the HT. Why are members not asking questions about these contracts, it's all too cosy. Perhaps bad behaviour is involved. It's hard not to think that way when this Council's cult of secrecy shows no sign of going away. It appears the Cabinet have decided there is no need for any meetings until 13th/20th December, cancelling 6 of them since September. Do they still get their allowances paid for doing nothing? Similarly, planning meetings seem to be getting cancelled/withdrawn/moved at an alarming rate in the past few months. Would not people complain if they held meetings just for the sake of it? If there are no decisions to make why have a meeting? Obviously I do not know who were the other bidders but would have thought that if they are local and always bid for Council contracts even they would start questioning how they are always outbid by S C J? A BUILDING and civil engineering company from Scunthorpe has been appointed to deliver the new industrial and office development at Centenary Park in Rotherwas. Commercial Property developer Priority Space has hired Britcon to deliver the 68,000 sq ft development over two phases. Centenary Park is a £6m collaboration with Herefordshire Council to deliver 60 new small to medium enterprise (SME) units at Skylon Park, a 110-acre business site in the Hereford Enterprise Zone. PRIORITY SPACE Ltd. is a company with assets of £51 so, if the contract goes wrong the Council would have no ability to seek financial redress from the company and claim their assets. You just know that there is something just not right going on with the awarding of these contracts?…but unless you are in on the inner circle,proving it is near impossible!…that is why you hope that the councillor we elect would say “hang on a minute” & bring it into question? !…but no nothing as I guess it is one of those perfunctory attitudes so ingrained in council culture that no one ever bats a eyelid?! 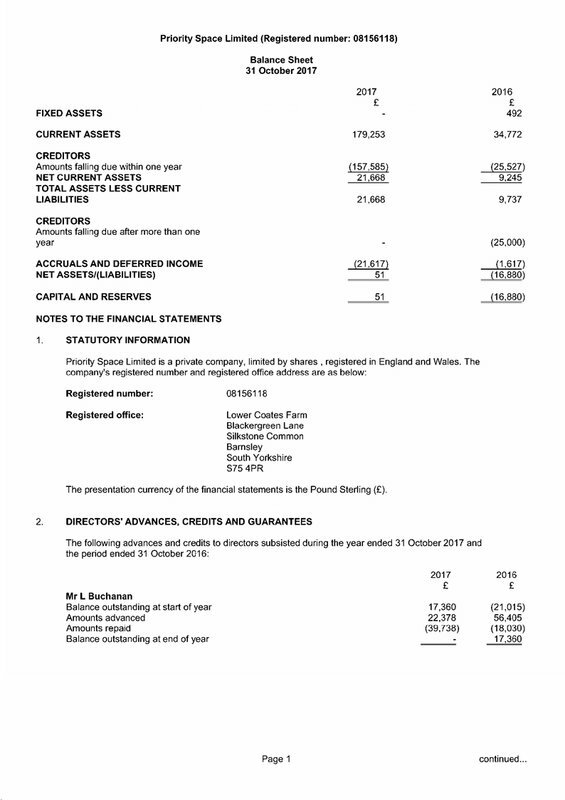 Priority Space Ltd comprises three chartered surveyors with 66 directorships between them but only £51 of capital and reserves and £21k of assets to front a £6m development ... you really HAVE to ask how much due diligence has been done by our very expensive council officers! Urbaser are Spanish owned, so tens of millions of pounds of UK council tax payers money is leaving the country instead of being put back into the local economy, much as happened with the disastrous Amey contract Herefordshire Council took on, Amey being a subsidiary of Spanish company Ferrovial. I'm not sure Herefordshire Council are involved in the Javelin Park facility in Gloucester, but they certainly are up to their necks (in debt) to the PFI Severn Waste one at Evesham (where Herefordshire waste is driven to) and the 25 year integrated waste management PFI contract with Worcestershire County Council (both schemes run by, you guessed, Urbaser). Are Councillors getting cheap holidays in the sun?